Childline Gibraltar is available 365 days a year to respond to Helpline requests between the hours of 5-9pm. On top of this, we offer a 24/7/365 Appropriate Adult service, to support detained juveniles when their parent/guardian is unable (or unwilling) to attend the police/customs interview. Thanks to your help, we were able to assist 352 service users in 2016/2017. The people that reach out to us, approach us for a wide variety of reasons. 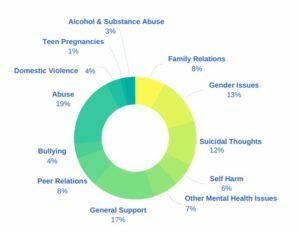 Last year, 1 in 3 contacts were about Mental Health Issues and 12% of the contacts we received concerned Suicidal Thoughts. In 2016/2017 our Appropriate Adult Service had 31 call outs. 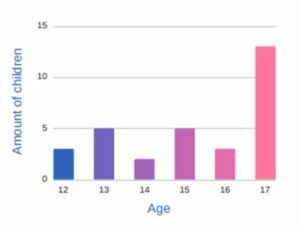 Almost half the call outs were for 17 year old boys and we were called out five times more for boys than for girls. The most common offence was theft. The youngest arrested child we supported was 12 years old. We trained 12 Licensed Facilitators to deliver “Time out for Parents” Positive Parenting courses who will be running three different courses a year. You can find a full overview of all the numbers and more information about Childline Gibraltar in our Annual report, which can be downloaded here. Your continuous help means we can be there when the youth of Gibraltar reaches out to us. We hope that you will support us by donating or signing up to join our team of volunteers.